Erster Theil der Karte von Asien welche die Turkei, Arabien, Persien Indien diesseits des Ganges und einen Theil der Tatarei enthalt. 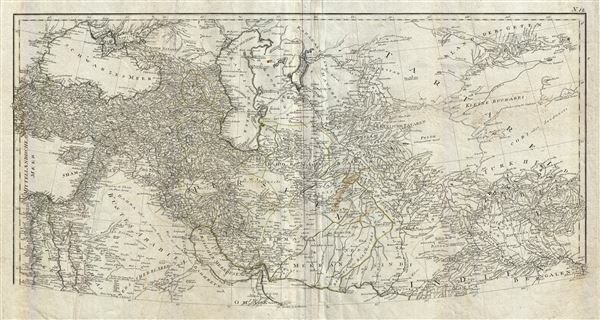 This is a highly detailed 1786 map of Persia and Arabia by the Austrian cartographer F. A. Scharembl. Representing the upper sheet of a larger map covering India, Persia and Arabia, this map, centered on Persia, covers from the Sea of Azov and Istanbul (Constantinople) to the Gulf of Oman to eastern India. Schraembl derived this map from the influential French cartographer J. B. B. d'Anville's similar map of 1751, which here has been re-engraved, updated, and translated into German. If offers excellent coverage of the central Asian portions of the Silk Route naming the centers of Samarkand, Bukhara, Lop Nor, and others. As this map was being prepared, the eastern portions including Turkey, Arabia, and most of the modern day Middle east, were under the waning hegemony of the Ottoman empire. In Arabia, the first 'Saudi State' had already been established in 1744 and, though owing nominal allegiance to Istanbul, dominated much of the central Arabian Peninsula. The presumably more valuable costal lands and river valleys of Mesopotamia (modern day Iraq) remained under direct Ottoman suzerainty. Persia at this time was itself experiencing the waning years of the short lived Zand Dynasty who ruled from the capital city of Isfahan – identified here. In a few short years, 1794, Aga Muhammad Khan would overthrow Loft Ali Khan, last Shah of the Zand Dynasty, and relocate the capital to the new city of Tehran. The subsequent era, the Qajar Dynasty, witnessed numerous military conflicts with the rising powers of Imperial Russia and the loss of much of Persia's territory. Schraembl prepared this map in 1786 for inclusion in his monumental Allgemeiner grosser Atlas. Though many of the maps in this atlas are dated 1786 the atlas itself was not complete until 1800, when it was published in Vienna. A lavish production, the Allgemeiner grosser Atlas was expensive and proved difficult to sell, resulting in a low publican run and considerable scarcity relative to other European atlases of the period. This is the northern sheet of the larger map representing plate no 12. In Schraembl's Allgemeiner grosser Atlas . Schraembl, K. A., Allgemeiner grosser Atlas, (Vienna), 1800. Very good. Northern sheet of larger 2 sheet map. Some wear and toning along original centerfold. Original platemark visible. Minor spotting here and there. Left half of map exhibits creasing along the length of map. Blank on verso.